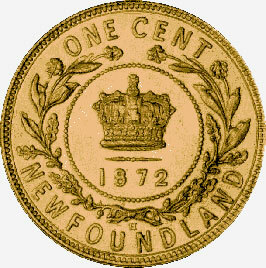 Newfoundland, a separate British colony, was allowed to issue its own coinage beginning in 1865. The lowest denomination issued was the one cent, which was one inch in diameter and made of bronze. The design of this coin was the subject of some discussion between colonial and home office authorities. One suggestion for the reverse design was the Newfoundland dog; however, the final decision was in favour of a more traditional motif, a crown surrounded by a wreath. The wreath consists of oak leaves and the pitcher plant, Sarracenia purpurea, an insect-eating plant native to the island. The use of the pitcher plant was analogous to Nova Scotia's use of the mayflower in the wreath on its cent and half cent. The Royal Mint in London, which struck most colonial coinage, had experienced difficulties in obtaining perfect lettering on the Nova Scotia and New Brunswick cent and half-cent pieces produced from 1861 to 1864; the fine portions of the dies tended to clog, causing defective letters on the finished coins. This doubtless led to the use of the bolder block lettering in the legends on the Newfoundland cent. The Newfoundland large cent, with essentially the same reverse design, spanned the reigns of three monarchs and was finally replaced by a smaller-size cent in 1938. The coin illustrated is part of the Bank's National Currency Collection. Photography by J.A. Haxby and C. Bray, Bank of Canada.